Bwin Poker does not accept players from the United States. The recommended site for your country is Americas Cardroom. When it comes to successful online poker brands, it is hard to argue with what Bwin has to offer. The company has found itself at the forefront of a number of online gaming opportunities and the poker site is one of the most popular, right after sports betting. Even though US players are unable to join in the Bwin Poker fun, this hasn’t stopped the site from developing a strong fan base. Much of this is down to the site’s popularity in Europe, where it is seen as one of the biggest online gaming sites. If you have any experience with the other Bwin sites, you will know what to expect from Bwin Poker as there is not too much difference between the sites on offer. If you are a Mac user keen to enjoy the full benefits of the Bwin site, you will be delighted to learn there is a Bwin Poker for Mac client. This means you can get access to one of Europe’s most popular poker sites, sharing the same poker network together with Party Poker, without having to compromise on safety or security at any point. This is undoubtedly a major factor for any online poker Mac player and is a very good reason why players should be looking to choose the Bwin Poker option. If you want to experience the Bwin Poker software before you download anything, there are options to play through. This is something that most players will appreciate and there is a lot to be said for an online poker site that provides players with the chance to play their games without having to sign up. This should be seen as a sign of confidence on behalf of the online poker site and means that players should always be looking to try the site out. The recommended payment method on the site is Skrill but there are plenty of banking options available to choose from on site. Visa and MasterCard options are available, as are debut card options, with all of these providing instant funding capabilities. E-wallet options like PayPal and Kalixa also provide instant funding but if you want to make a bank transfer to your account, this can take up to 7 days. The Skrill method is also the preferred option for withdrawing funds from the Bwin Poker site and the minimum transaction is 10 euros. This is preferable to the standard debit and credit card options that have a minimum level of 20 euros to consider. Other withdrawal methods to consider are Western Union, bank transfer and electronic options like PayPal, Kalixa and Neteller. There is a fee attached to withdrawing money via Western Union but all of the other methods have no fee imposed by Bwin Poker. The Bwin Poker site has an aim to turn a beginner into a winner, which is why they have such a strong focus on new players. There is a 100% matched deposit bonus available up to $500 for all new players. A player will have 60 days to pick up their bonus and they will need to pick up 6 times the bonus amount in poker points. This is a fairly standard play-through for players on an online poker site but there are other bonuses included in the welcome pack. All new players are provided with challenging promotions. Taking on other new players can be the best way to develop skills and confidence on an online poker site and Bwin Poker provides this from the off. In addition to these benefits, the site also provides 1,000 market points for new players. These points can be spent on bwin merchandise or providing entry to some of the tournaments that are on offer to players. With a lot of poker skill training facilities provided for by the site, there is a lot for new players to benefit from when they sign up with Bwin Poker. When it comes to tournaments, you really have a lot to choose from with the Bwin poker site. If you are looking to have a lot of poker fun without actually spending much money, you will be delighted to know that there are several freeroll events taking place every single day! Players can play for their share of $250, $250, and $500 respectively, or tournament tickets or bonuses in the afternoon and evening every day. 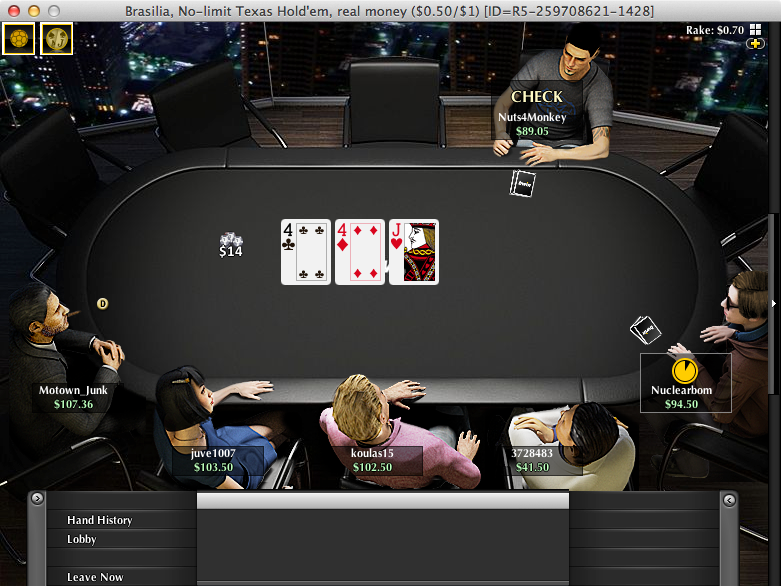 The daily freeroll tournaments form a small part of the overall multi-table tournament events that take place each and every day on the Bwin Poker site. There is poker action running around the clock which should ensure that poker fans always have a reason to log on to the Bwin poker site. An example of the daily offerings available on the Bwin Poker site is their guaranteed game. These take place several times a day and the longer you hang on in there, the more money you are in for a share of. You will see that there are daily $1,000, $1,500, $3,500, $4,000 and $5,000 guaranteed tournaments, and all of these come in different variations. There are also two daily $25,000 guaranteed tournaments, one being a re-buy, the other being a re-entry event. 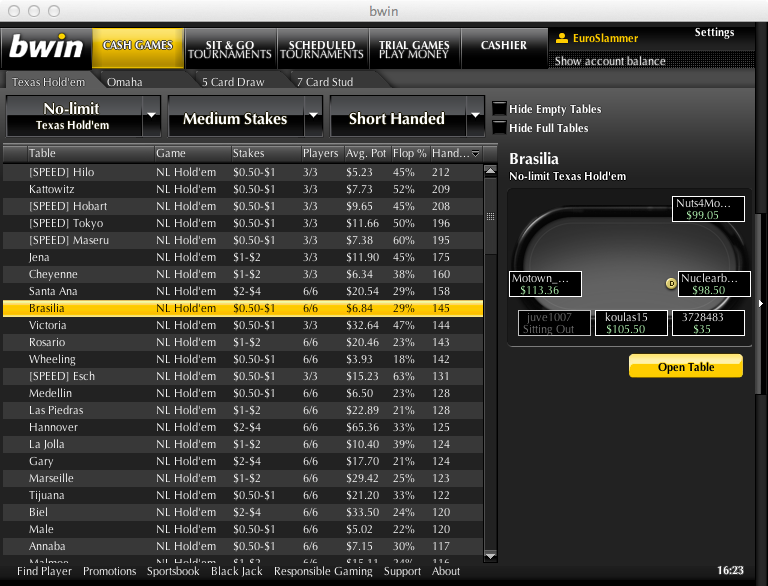 Most online poker sites have a big event lined up for Sunday and the Bwin Poker site is no different. It doesn’t matter if you are a PC or Mac user; you can look forward to taking part in the big $200,000 guaranteed Sunday game. Bouncing back from defeat show strength and character but with such a big cash prize on offer, it can also provide players with a very lucrative way to play online poker. Besides these, Bwin offers several other guaranteed tournaments on Sunday, including a $10,000, $20,000, $50,000 and a $100,000 High Roller event with re-entry options. If Saturday night is more your style as opposed to Sunday evening, you will be delighted to know that the Bwin site caters for your needs too. The main tournament takes place every Saturday evening and provides players with the chance to play for a guaranteed $30,000 prize pool. It may not match the big Sunday games for prize money but it certainly gives players the chance to have a great Saturday night for a buy-in of only $200! If you are a poker player that prefers to play late at night, you will find some tournaments in the range of $1,000 to $2,500 depending on the day. When most folks are heading to bed, you can be settling down in front of your Mac, looking to play your way to a share of one of the guaranteed prize pots that are on offer. At the moment, the Bwin Poker site is not providing any rakeback facilities to their players but it is always worth keeping an eye out on site for any change to this set-up. It could be argued that the size and scope of the Bwin site mean that there is no great need for the site to provide this facility but as the level of competition in online poker sites continues to rise, you may see more options being provided by the main sites. When it comes to online poker sites, it is hard to argue with what Bwin Poker has on offer across the board for players. There are plenty of tournaments to enjoy and there are more than enough bonuses and promotions to keep players involved with the event. If you are looking to make the most of your online poker time, the Bwin Poker for Mac option is one that deserves to have your full attention.